Ramkrishna Yadav, better known as Baba Ramdev, is a spiritual leader and yoga guru. He is well acclaimed for his works in Ayurvedha, Politics, Busines and Agriculture. Ramkrishna Yadav, better known as Baba Ramdev, is a spiritual leader and yoga guru. He is well acclaimed for his works in Ayurvedha, Politics, Busines and Agriculture. Baba Ramdev net worth is estimated to be worth $220 Million and much of his income and wealth comes from FMCG business and Royalties and Yoga. Read on to know how the Indian yogic guru makes his wealth and what he is doing now in 2017. Born to a farmer’s parents in an Indian village of Alipur in the Haryana district on 25th December 1965, Ramdev grew up in his hometown. He earned various forms of education, including Indian scripture, Yoga and Sanskrit in various Gurukuls. He was the student of Acharya Baldevji in Gurukul Kalwa. 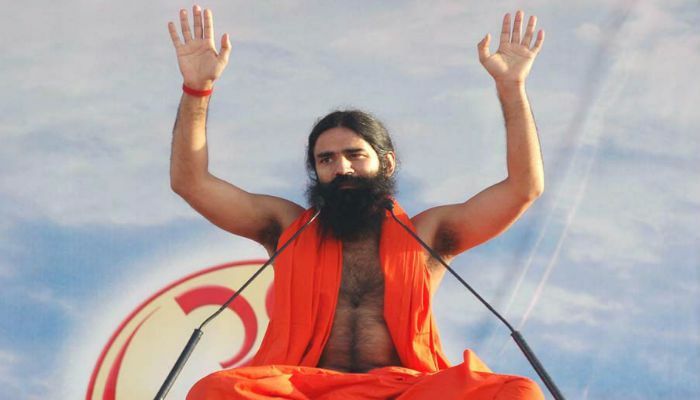 Ramdev took sanyasi diksha and adopted the name Swami Ramdev from Swami ShankarDev Ji. While living in Kalwa Gurukul in Jind district, Haryana, Ramdev offered free yoga training to villagers. Then he moved to Haridwar in Uttarakhand, where he practiced self-discipline and meditation, and spent several years studying ancient Indian scriptures at Gurukul Kangri Vishwavidyalaya. Ramdev began his career by establishing ‘Divya Yog Mandir’ in 1995 with an aim to preach yoga to all classes of people in the nation. Soon he received recognition when he went on to showcase his yoga skills in a regional television and gained large following thereby. Many Bollywood celebrities including Amitabh Bachchan and Shilpa Shetty were the students of Yoga guru. Soon after grabbing enough attention in the country, Ramdev went on to tour several countries, including the US, the UK and Japan. He was invited by Kofi Annan to UN deliver a lecture on poverty alleviation in 2006. Ramdev established Patanjali Yogpeeth and Patanjali Ayurved (an Indian FMCG company) in India and different part of the world in 2006. In 2007, Ramdev received an honorary doctorate degree from Kalinga Institute of Industrial Technology for his notable contribution towards Vedic Science of Yoga. He gradually ventured into politics in the late 2000’s and started different campaigns against the then-government corruption. He insisted the government to formulate Jan Lokpalol Bill, a bill to appoint an independent body that would investigate alleged government corruption. After the present BJP government assuming the office in 2014, Ramdev has been expanding his business across the country and in International arenas. His wealth and popularity have doubled in the last three years. His FMCG Company has evolved to a powerful establishment since then, rivaling against the likes of ITC, Colgate, Dabur and Godrej Consumer. He has received accolades and mentions in several publications since 2007. India Today Magazine ranked Ramdev as the 5th most powerful people in India in 2017. He has been caught in several controversies, including the claimant of curing homosexuality. His medicinal and ayurvedhic products have been in the news often as they found out to be substandard by Food and Safety Drug Administration. Baba Ramdev lives in Mumbai in a posh house estimated to be worth about Rs 4 crore. He owns several properties across the country under his trust. His collection of cars isn’t that impressive in spite being a millionaire. He owns a Audi and a Range Rover.